Make delicious Napa Valley Cabernet wherever you live with this all-inclusive kit. Wine making is a simple, natural process. Add yeast to grape juice, let it ferment in a controlled environment, and boom. Yet wine's mystique can make the vintner's art seem out of reach. Consider this kit a pool floaty for the beginner winemaker: It helps you jump in without fear. The kit contains all the equipment and ingredients you need to make one gallon (approx. five 750ml bottles) of robust Cabernet Sauvignon. Representing the true terroir of Napa Valley and the deep, full-bodied character of this noble California red grape, this wine has the typically intense Cab flavor and aroma. The only challenge will be learning your winespeak, so repeat after us: "My 2017 Chateau Moi Cabernet is flamboyant yet austere, with a laser-like insouciance, a bouquet as muscular as a Malibu surfer, and a finish as long as the San Mateo-Hayward Bridge." Assembled in Orlando, Florida. Cabernet Sauvignon juice made in Napa Valley, California. 14% ABV. My Dad was so intrigued with the gift. I'm anxious to hear how it turns out! Great for couples who love wine! She said it was very easy to follow the directions. My dad loves his wine making kit. It is such a unique "uncommon" gift and he is excited to start making delectable wine. â�¤ï¸� Thanks Uncommongoods for selling items that stand-out and make the gift-giving experience extra special. Great holiday gift for brother & sister in laws! I got this for my brother and sister in law and they loved it! They love IPAs and it gave them a fun opportunity to do something as a couple. They got to bond, have fun, and drink great beer! Got this for my dad for Fathers Day. He hasn't used it yet, but was tickled by the idea. 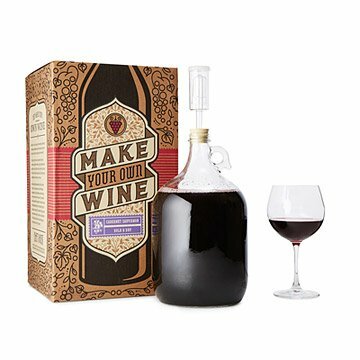 I was very unsure of the process, but the instructions were pretty easy for us to follow and everything was included except the clarifying vessel and wine bottles. The process took a month to complete and the end result was as nice a Cabernet Sauvignon as I've ever had. Nice legs, aroma and taste. You will need a large pot or container at two weeks to transfer the wine for clarifying and then back to the jug after it's been cleaned. After two more weeks, you can bottle the wine or let it age longer. Now looking for more grapes to do the process again.